Let’s face it – it’s easy to spoil your dog! We all do it, and why not!? As pet parents, we value our family pets and look for ways to demonstrate how much we love them. We want their lives to be truly happy and healthy. On August 10th Spoil Your Dog Day, we have permission to go all-out with the pampering. What are you planning for your furry friend? Here at Pet Factory, it’s a no-brainer. We pull out the USA-made beefhide chews and our dogs go wild. Spoil Your Dog Day is a great excuse to treat our pups to the everyday goodness of natural Pet Factory treats. Pet Factory beefhide chews are delicious tail-wagging fun for all dogs. Tasty and easy-to-digest, they are a guilt-free treat on Spoil Your Dog Day, or any day of the year. We can all make a difference in the lives of dogs and pets. Visit a shelter, play with adoptable pups, or donate to a pet charity. Our delicious Pet Factory USA-made beefhide chews are a real treat for your dog, every day of the year. Our tasty treats are easy-to-digest, so pet parents can feel good about giving natural beefhide chews to their dogs. Does your dog love to chew? Most do – our thick beefhide chews provide a safe chewing outlet for your dog and they are 99.2% digestible, as confirmed by independent testing labs. Beefhide is the Original Natural product, with NO hormones, added dyes, added salt, added sugar, preservatives, fillers, GMO’s, glues, or additives. There is NO corn, wheat, gluten, grain, or soy in beefhide. Natural beefhide chews are high in protein and low in fat. With fewer calories per ounce than a typical dog biscuit, you can show your love and appreciation without the fear of overindulging them. Try our natural, unflavored treats for daily chewing enjoyment or change it up with our basted treats flavored with food quality ingredients. Only thirty minutes of daily chewing can offer many dental benefits, including less plaque and tartar build-up. It’s okay, go ahead and spoil your dog today! Whether you go for a long walk or stay home and cuddle on the couch together, your dog will feel the love. It’s all about giving them that extra quality time and attention On Spoil Your Dog Day, and every day. Since 1989, Pet Factory has been America’s premier manufacturer of USA-sourced beefhide bones and chews, made exclusively from Premium Beefhide from American-raised cattle. 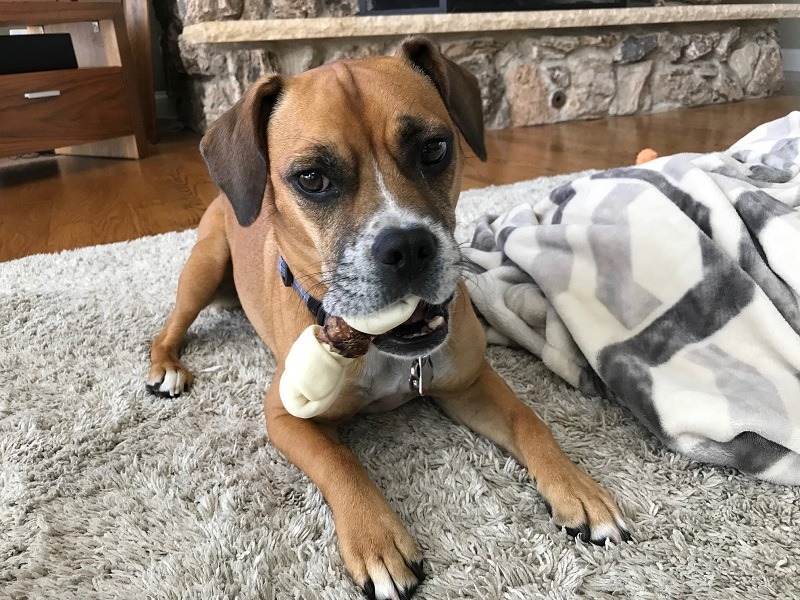 Our treats come in a variety fun shapes and sizes to suit every dog, including knotted bones, rolls, chips, and novelties in original or chicken flavor. Pet Factory beefhide treats are available at your local pet shop and at national pet product retailers.